Although it is titled like a sequel to the 2005 film starring Donnie Yen and Sammo Hung, it has no connection whatsoever to the story at all. Apart from Wu Jing and Simon Yam, the rest of cast, producer and the writers did not return for this spiritual sequel. Director Wilson Yip only came back as a co-producer while Yen and Hung, who were also the action director and choreographer for the first film, are completely not involved for this one. Thankfully, even though it’s directed by Cheang Pou Soi whose recent work was The Monkey King (2014), Sha Po Lang 2: A Time For Consequences did not turn out a disappointment. The plot is not as straightforward as the first film, with more than one theme while it explores the disturbing crime of human organ black market, where hundreds of ordinary people are being kidnapped and smuggled by criminals every year to have their body parts brutally cut away and sold. The nonlinear narrative follows three groups of characters in Hong Kong and Thailand before they all inevitably collide. Simon Yam plays Chan Kwok Wah, practically the exact same cop role that Yam played in the first film but just not as significant. Kwok Wah has been after the crime syndicate led by Hung (Louis Koo), who has a fatally weak heart and decides to rob the rare heart of his own brother, Man Piu (Jun Kung). After Kwok Wah arrests Man Piu, Hung’s men apprehend Kwok Wah’s undercover nephew Chan Chi Kit (Wu Jing) and keeps him in a prison in Thailand where its warden, Ko Chun (Zhang Jin), is one of Hung’s most loyal and deadly men. 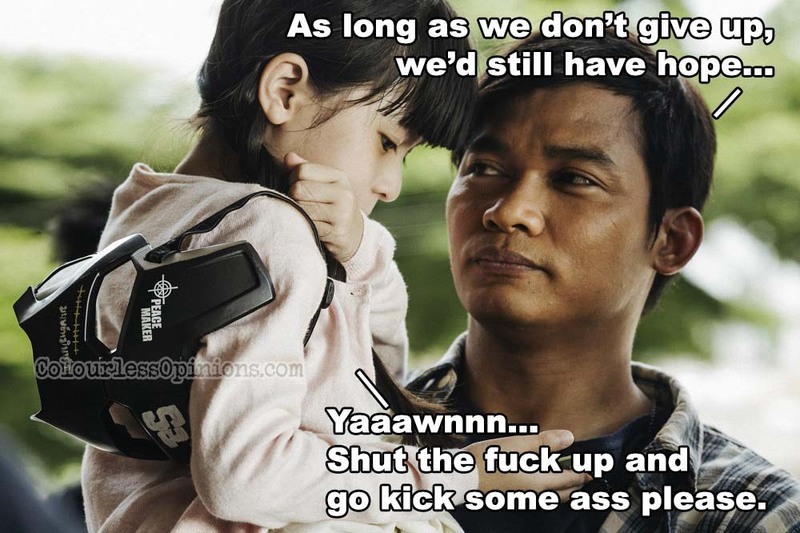 Caught in between all of these is Chatchai (Tony Jaa), a goodhearted small-time guard at the prison who’s desperately looking for a bone marrow donor for his dying daughter. Ko Chun has been kind to Chatchai but little does Chatchai know that the rare donor who the hospital has been trying to contact is actually Chi Kit. It sounds like a lot of massively unbelievable coincidence, but the film sort of needs it for its themes of humanity, hope and fear. Despite the film’s flawed and illogical moments (like why wouldn’t the hospital call the police when a man in prison uniform comes in with seriously injured men), it is quite impressive how such script and complex storyline by Jill Leung Lai Yi (Rigor Mortis) manages to work out for an action flick. It may not have the same kind of epic tension rivalry and staredowns like in the first film, but it’s easily entertaining. It also has some strange deliberate similarities to the first film, like short knives versus a stick, breaking glass windows, dilemmas between right and wrong, and the minor involvement of a little girl character. However, the narrative’s uneven character development has caused the lack of genuine emotional engagement. The ending of the film, after all that’s been invested in, is shockingly cliched, choppy like a last-minute add-on and symbolically undefining. I wouldn’t be surprised if there’s an alternate ending like the first film. This film may just be Wu Jing’s career breakthrough as he’s showcased way more than being just capable in martial arts and stunts. 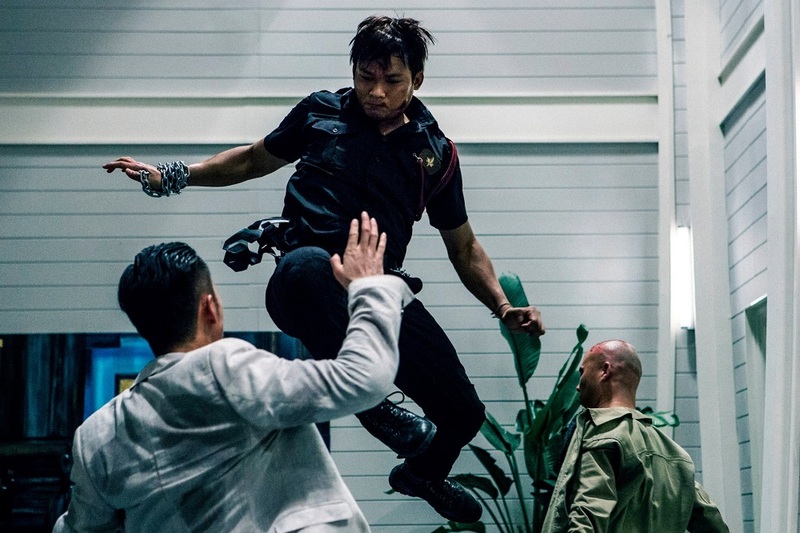 With their impressive performances as the protagonists here, both Wu and Tony Jaa have proven that they have better than acting chops with the ability to express emotions more convincingly than Donnie Yen was able to when he was at their age in the first film. Wu’s role is definitely one of the more challenging ones he’s got as he’s required to portray a cop who’s miserably struggling with drugs and is desperate for survival. If the film had better character development, these likable characters and their situations and action sequences could’ve been way more engaging and gripping. Due to the lack of memorable and impactful action sequences, it may seem as though the film is more drama than action, when in fact, I think it has more action than the first film. 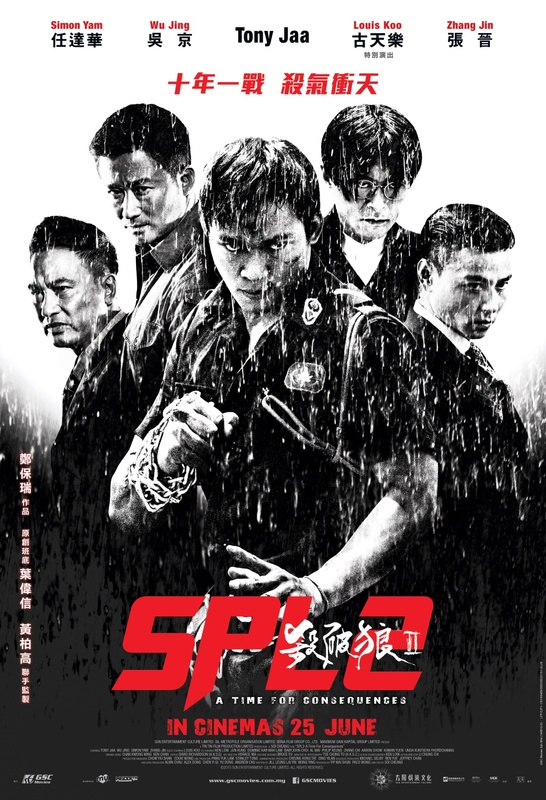 The most impressive action sequence in SPL 2 is the prison-phone-signal scene (I shall not spoil it for you) where there’s a lot of wide-angles and long one-shots of the focused action between Wu Jing and Tony Jaa while also showing the chaos that’s happening in the background. We get to see a lot of Jaa’s trademark Muay Boran moves versus Wu Jing and Zhang Jin’s fusion Wushu skills (both apparently competed at national level in China), which is just totally fun to watch, even though it may be a bit flashy and over the top at times, particularly Zhang’s well-groomed K-pop artist-like character who could jump and move in the air unnaturally. As Zhang is the ultimate final boss (villain to beat) for the protagonists, the film brings back the old-skool 2-versus-1 showdown, which I personally don’t prefer, but the teamwork between a Thai and a Chinese is undoubtedly uplifting to watch. The fight sequences may not have same level or quality of gritty MMA (mixed martial arts) choreography, direction and conveyance which made the first film the awesome game changer and classic that it is, but in overall, SPL 2 is still a highly enjoyable action drama on its own. Malaysia censorship: I watched the public screening at TGV cinemas and noticed that there’s a scene shown in one of the earlier trailer edits that goes completely missing in the film. I’m not sure if that scene was only meant for trailers to market the movie, or it was cut. The film is indeed quite violent and if there’s anything else that’s censored, it’s done quite skillfully as I didn’t notice as sudden jumps. Second opinion: My girlfriend, who hasn’t seen the first film, thought that SPL II is okay in overall but the last fight scene is a bit too fake. Verdict: It is not connected to the story of the first film, nor is it as masterfully produced either, but it does have a good balance of strong drama and entertaining action.